With fall athletics starting up, your players will be back on the field, practicing for the first time since spring. 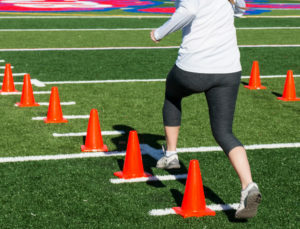 If you are practicing a rough-and-tumble sport like football or rugby or something with potential collisions like soccer or field hockey, falls are all but guaranteed. Your synthetic turf field contains a shock absorbency layer to take most of the impact from a fall, protecting against injury and concussions. However, outside elements and age can affect its performance. Before your athletes take the field for the season, it’s important to schedule GMAX testing to check the effectiveness of your field. How Does GMAX Testing Work? During a GMAX test, the shock absorbency is measured from different points around your field by dropping a 20-pound weight from two feet in the air. Upon impact, measurements are taken electronically to determine the force taken by both the field and the weight. The lower the score, the more force is being absorbed by the field, rather than returning to the player. How Often Does My Field Need GMAX Testing? Your field is continuously changing, from rubber infill moving due to wind or kicks, the angle of the grass and the age of the field. There are many factors that can lead to a change in GMAX scores, from the material used in the grass to the amount of foot traffic your field sees in a given period of time. Since the factors affecting your GMAX score can change, it is recommended that you have your field tested several times per year to make sure there aren’t major issues to correct. Turf Prep offers an annual maintenance plan that includes six onsite visits to conduct GMAX testing, spread out through the fall and spring. If you are interested in having the safety of your synthetic turf field tested, contact Turf Prep today! While we are at your site and inspecting the field, we will be able to redistribute the rubber infill and touch up any faded paint. Turf Prep can be reached by calling 1-877-774-8873 or by filling out our online form.